Julian Serrano told us in our exclusive interview with him that the kitchen was very important to him. At Julian Serrano, he has a separate oven and two chefs dedicated only to paella. Thus, it should be no surprise that Julian Serrano boasts not one, but two open kitchens, perpendicular to each other. In the kitchens, the colorful tile from the dining room is replaced with a pristine white. 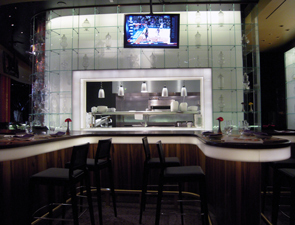 The actual window into the kitchen is framed in the same luminous material as the luminous curve under the bar. Enclosed on either side of the windows, the surroundings of the open kitchen are flanked with glass shelves filled with glass vessels displaying market goods. A woven, metallic-colored pseudo drop ceiling provides additional separation between the dining room and the open kitchen while spotlights reveal the beauty of the cuisine in front of you. That beauty is reserved for three viewing areas, fitting approximately a dozen guests in total. You'll realize that Julian Serrano's Spanish-focused wine list is special when the large purple-, red-, orange- and brown-framed book arrives. In it you'll find the names of approximately 500 bottles that are available. 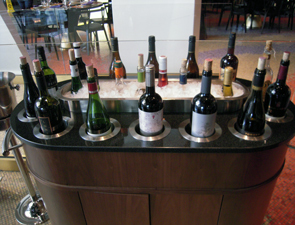 For those who just want a glass, Julian Serrano offers a variety of options, including several sherries, such as the prestigious Don PX Bodegas Toro Albala (Montilla-Morile), the rare Palo Cortado (E. Lustau, Peninsula) and the more commonly known Palomino Fino (Gonzalez Byass, Tio Pepe). There's also red, white and non-alcoholic sangria with fresh fruits and juices by the glass or pitcher, not to mention about 30 wines by the glass, including champagne and sparkling wines in 5-ounce servings and red, white and rose in 6-ounce servings. For something with a little more kick, try one of several cocktails straight up or on the rocks. Specially created for the restaurant, they include several sangria-themed cocktails like the Serrano Bloody Mary (Absolut Peppar, cherry tomatoes, spice) and the Dulce y Picante (Spanish brandy, St. Germain, strawberry, cayenne pepper). Because a number of these cocktails include muddled fresh fruit, you won't feel too guilty imbibing. Of course, there also are Spanish brandies, tequila, cognac, whiskey and, for something a little lighter, a variety of international beers.